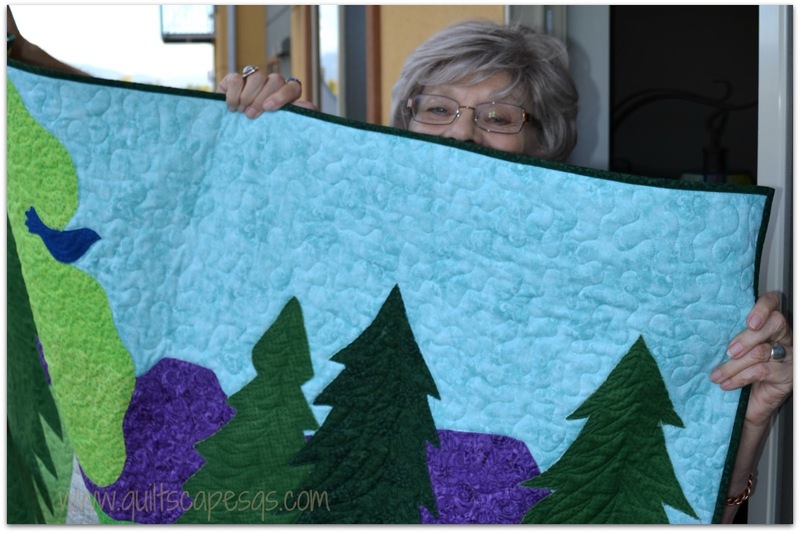 Aunt M Quilt Chronicles, Chapter II: It's never too late to start quilting! 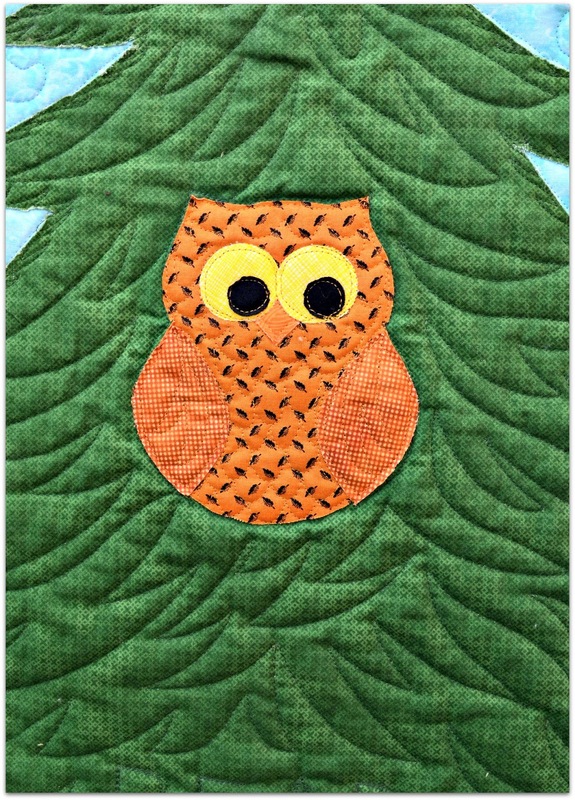 Last year, she and Uncle Jack enlisted my help to make two quilts which she named "Owl Always Love You" (<< click to see that story). It has been a delightful process! 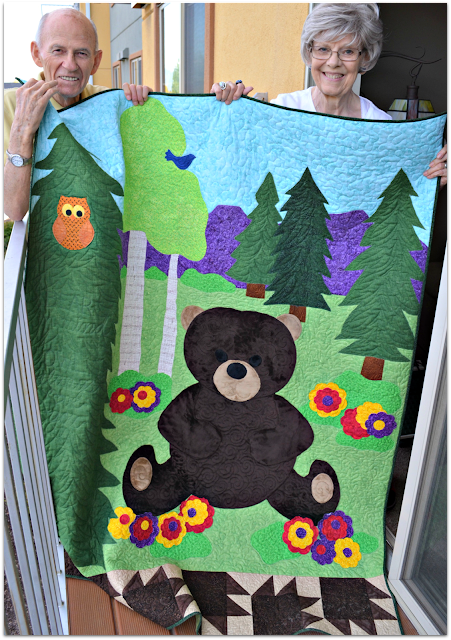 We've just finished two new quilts with the theme, "Bear In Mind Owl Always Love You" because a couple of the granddaughters love bears. I began by sketching a rough design in EQ just for an idea and to estimate fabric requirements. Aunt Margie gave suggestions and picked colors, then we headed to the fabric shop! 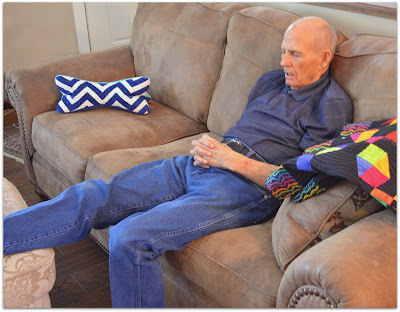 My Aunt just loves looking at all the colors on the bolts and choosing the fabrics, while Uncle Jack heads to the couch with a little gift bag for the Man-shopper filled with snacks and an Outdoor Life magazine. He wakes up just in time to bring out the credit card. We began by preparing the quilt background. Aunt Marjory starched all the large pieces of fabric and drew out a skyline of the hillside from her hometown in Archer, Idaho. Uncle Jack cut it out for her and we used a glue stick to position it on the sky fabric. 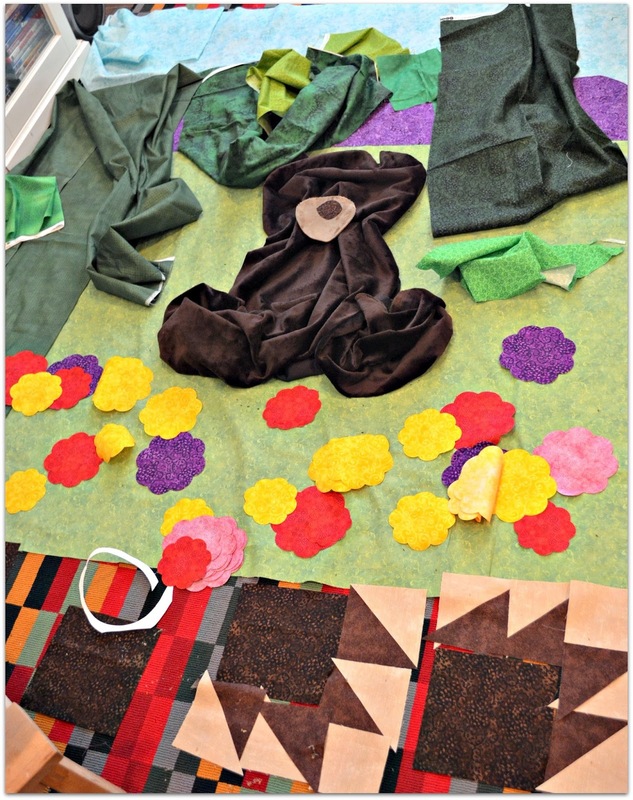 Auntie M used the blanket stitch to sew down the hillside. 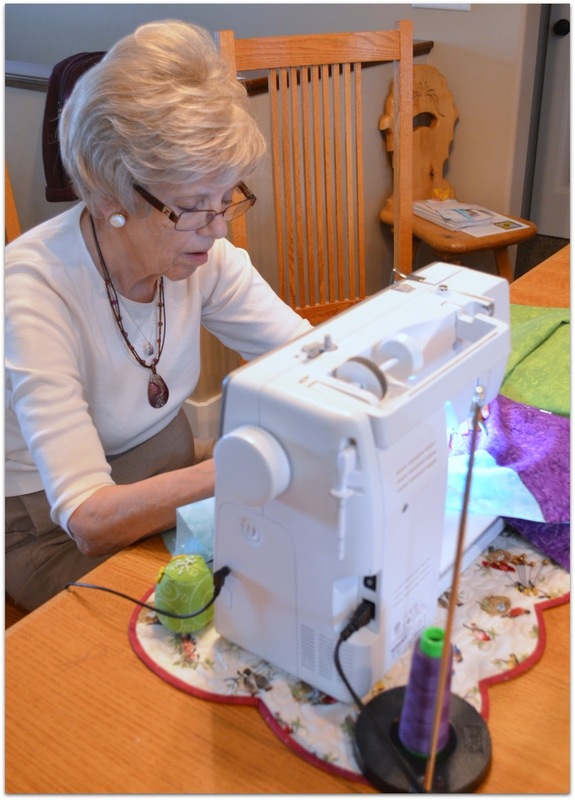 Her Parkinson's disease causes her hands to shake a bit, but that really doesn't get in the way of putting the fabric through the sewing machine. 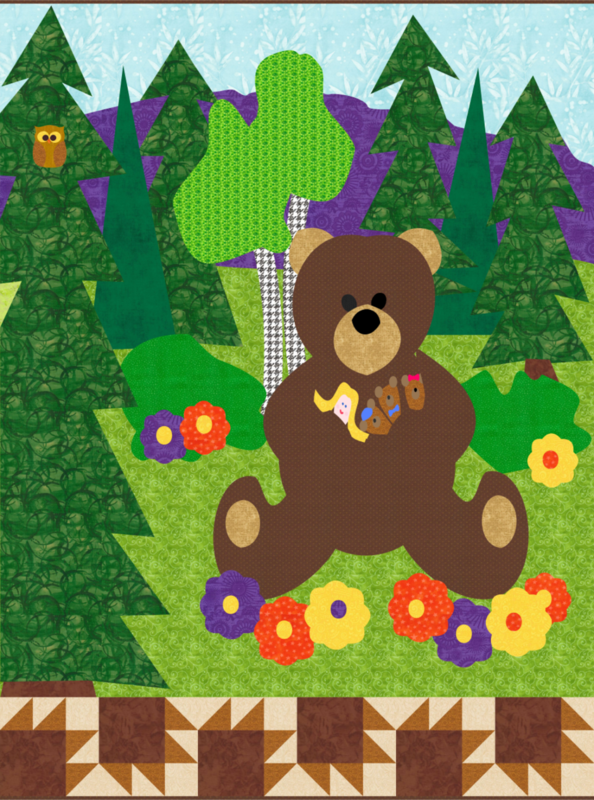 I began piecing the bear claw blocks, trimmed out any double layers on the background, squared it up, then we laid out the quilt to decide where all the applique' pieces get to live. For this quilt, Uncle Jack cut out all the flowers on my AccuQuilt die cutter (Rose of Sharon die). 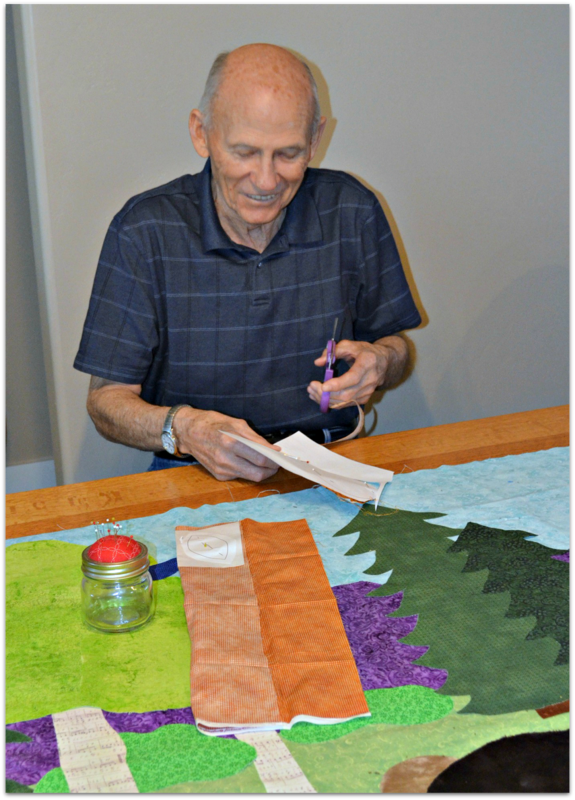 Aunt Marjory's technique of "improv applique'" worked well with her hillside, so we did the same with the trees and bushes, making a rough outline with chalk on the fabric and handing it off to Uncle Jack, the designated "cutter-outer". He does really well cutting left-handed with right-handed scissors... I should get him a new pair. If the fabrics are starched super-stiff, that helps too. 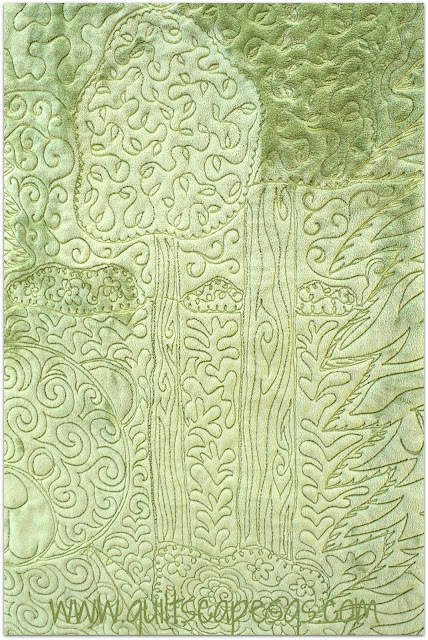 On this quilt, I decided to "appli-quilt'": that is, combine the applique' and quilting process at the same time, saving hours at the sewing machine. So we fused and/or glued the pieces into place (all raw-edge), and I took it to my longarm quilting machine. We used Cuddlesoft plush fur for the backing so it's a warm-hug-of-a-quilt. At the last minute, Aunt Marjory decided to include an owl in the tree so she could keep her theme going of "Owl Always Love You". Then she drew out a little bluebird of happiness to sit in the aspen. The bear sits in a little patch of flowers. 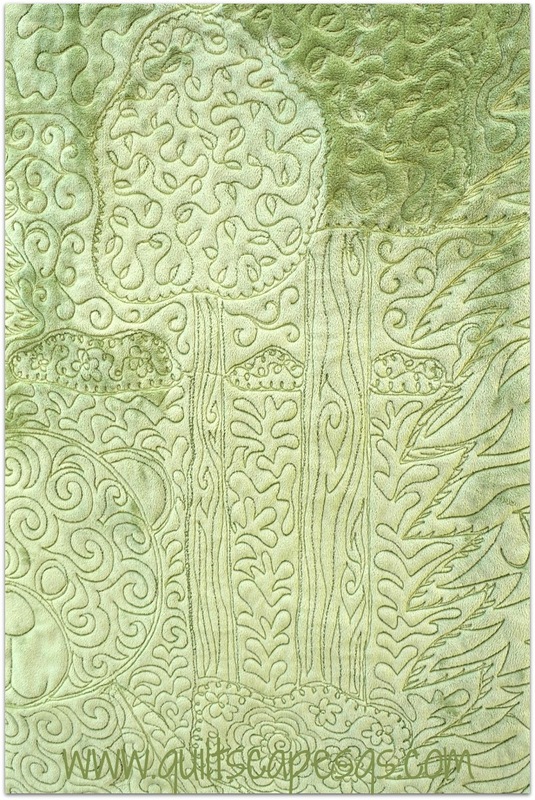 We used Cuddle plush fur for the backing, and you can see some examples of "appli-quilt" stitches. 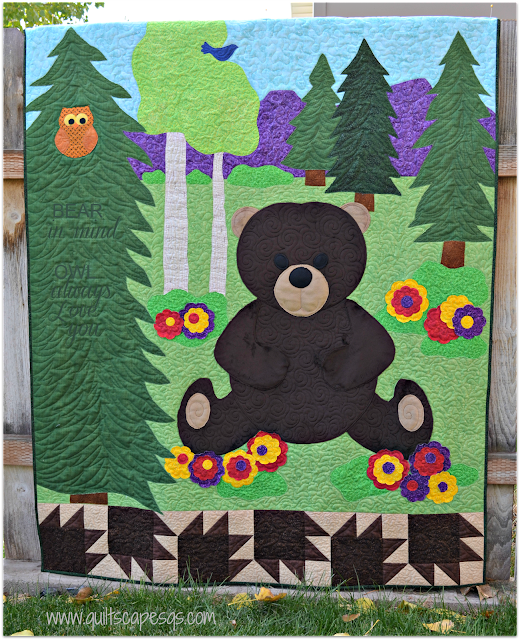 I've had it in my mind to make a quilt of my own using a "Three Bears" theme, after finding an old tape recording of my Mother and then 6-year-old sister telling a silly adaptation of the story back in 1982. It's a pretty funny little version of the three bears which makes me giggle, but my Mom has been gone for 17 years now, so it sometimes brings a tear to my eye as well. 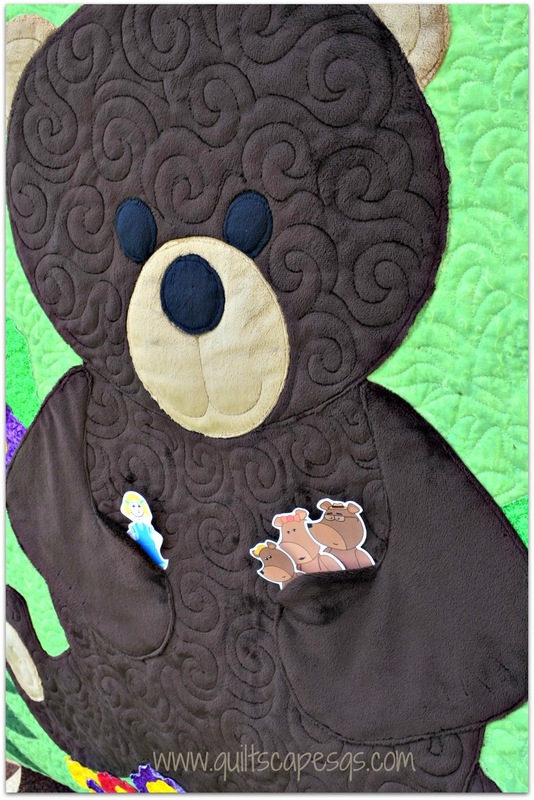 To incorporate the Three Bears story in this one-bear quilt, I lined the bear's arms to become pockets, then top-stitched in position after the quilting was complete so they can hold finger puppets of Goldilocks and the Three Bears. We ordered a couple sets of the finger puppets from Amazon and they are on their way, so the paper cutouts will do for pictures. 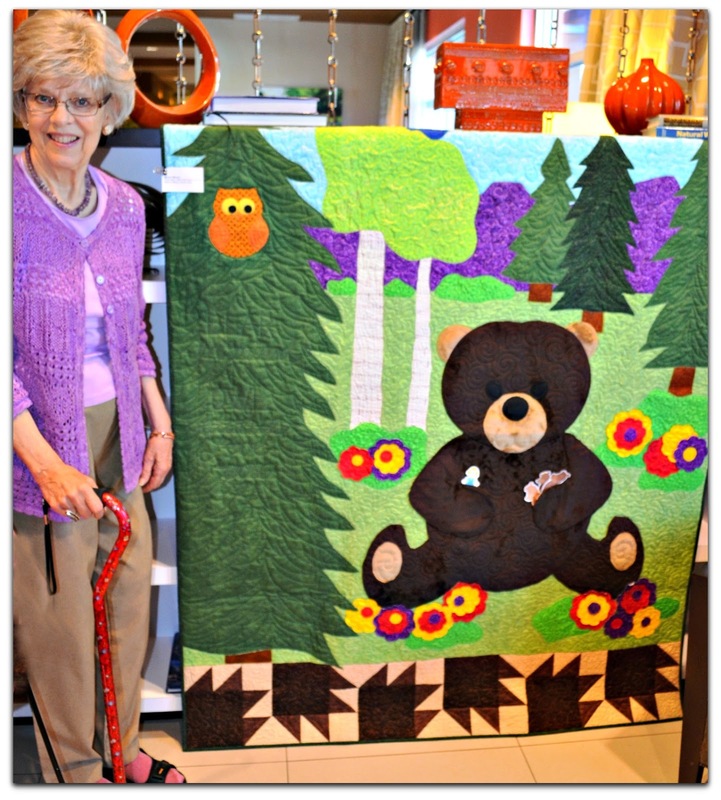 This week, the senior living center where my aunt and uncle reside hosted a little quilt show. And Aunt Marjory got to experience her first "Sew &Tell". You know what that feels like! After all the ooohs and aaahs, I think she's hooked! Meanwhile, we've already started on the next couple of quilts... elephants! 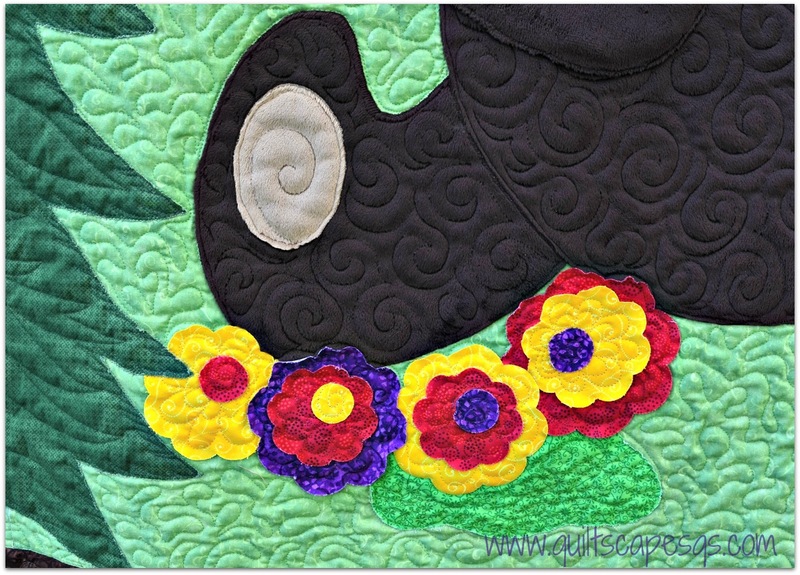 These quilts are treasures in many ways. I cherish the time I get to spend creating and laughing with Aunt Marjory and Uncle Jack; they treasure their granddaughters who in turn will treasure the quilts made by their grandparents' hands. Now all that's left is the quilt label! And lucky for me, I found a way to share Mom's version of the Three Bears story right on the label - I can generate a QR code from a company called Stikr It, and the code will link to any digital file. I'll print a label to include the QR code so anyone can scan it and listen to the story. Looks like I'll need to make one of these quilts for myself! Then, I'll be able to hear my mother's story-telling voice whenever I wish. 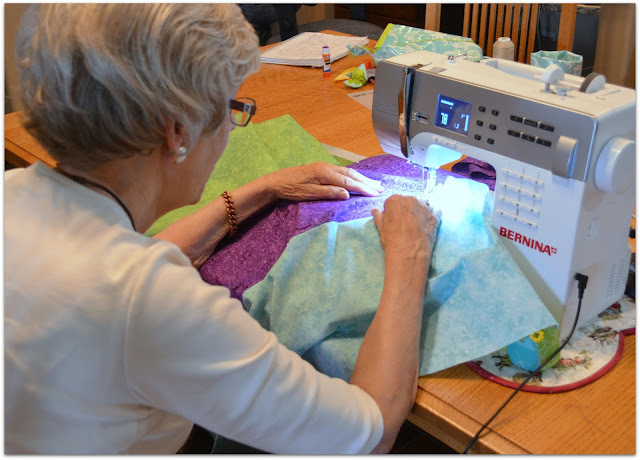 That's what quilting is all about, sharing creativity, stitching lives together. And by the way, Aunt Marjory, Uncle Jack: Owl always love the both of you! Want to listen to the three bears story? 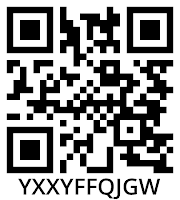 Download the www.stkr.it app on your smart phone, scan the code, then push the Play button. Or you can go to their website ↑ and type in the letters listed below the code to listen. "Goldie, come back! You didn't finish my porridge!" What a wonderful story, thanks for sharing! This is such a great quilt!! the quilt turned out really cute and your aunt is super young looking, must run in the family. I do not have any aunts or uncles and this is a most precious memory for you! Thank you for sharing! Wow, that is fantastic! Such a wonderful story and how sweet that your Uncle helps in the creations. The quilts are absolutely beautiful and your Aunt is so young looking. I hope I look that fabulous when I'm 84!!! 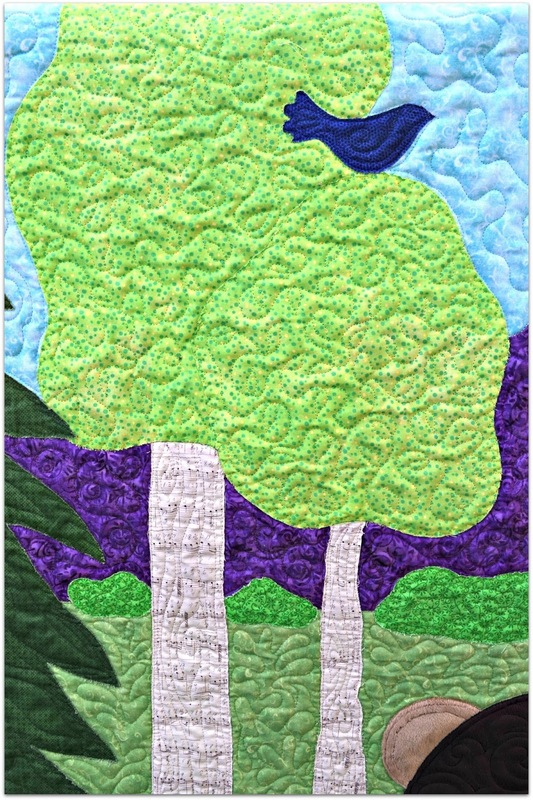 Deonn, your quilting looks amazing on that adorable quilt...love it!